①, special drying equipment, such as: air drying machine. ②, rely on equipment to achieve. The main problem is the recipe to make two different polar substances combine enough. Now a lot of solutions. 3), a suitable process temperature. In ensuring plasticized premise, the temperature as low as possible. ①, to solve the problem of bridging flour, in order to ensure the continuity of cutting, in order to make a good product. Cutting uniformity problem ②, wood flour and plastic (most equipment manufacturers have not been resolved. Causing plastic additive amount increases to make it right the problem of uneven charging). Must be mixing plastics good equipment, can be achieved. 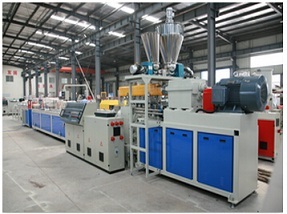 Such as using the same parallel twin-screw device; his advantage, mixing plastics, good exhaust effect, is engineering plastics granulation equipment, two-step process, with his granulation, one-step, with his mixing plastics Other devices directly into the extruder, the effect is more pronounced. 3), mold design and cooling shaping technology. The nose is related to the important parts of the extruded product quality, due to the high amount of WPC addition particularity of the extruded material and wood flour illiquid and difficult to cool, the conventional mold and shaping equipment has been unable to meet the needs of the This makes the head of design in addition to ensuring a smooth transition outer flow channel design with a reasonable flow distribution, but also on the ability of the nose to build pressure and temperature control accuracy important consideration. Liquidity WPC poor, the mold should try not to use baffle blocks and other structures, but should be used to adjust the flow rate of the flow channel cross section by changing the flow channel size; in the mold of sufficient strength, minimize the number of brackets and ribs size; and the use of a large compression ratio, in order to ensure greater the extrusion pressure, in order to facilitate molding. Based on the thermal sensitivity of WPC, the mold should adopt a larger structure size to increase the heat capacity, so that the whole head temperature stability can be strengthened; and the extrusion direction dimension whichever is less, to shorten the material in the handpiece residence time; and rational arrangement of the handpiece heating and cooling device, making it the heating and cooling speed, high precision. British design the flowable die, without the use of a perforated plate, may also cooling the inner surface of the hollow profile, reduced melt pressure and increased yield. Structure ① rely on equipment to solve. ② the degree of fiber orientation in WPC have a greater impact on product performance, reasonable design flow channel structure, to obtain a suitable fiber orientation to meet the performance requirements of the article. So far, the WPC device equipment single screw, conical twin-screw and one-step equipment. The former, performance products, mainly by process recipe to adjust, adjust narrow face; the quality of products affected to some degree. The latter, one-step devices come and processes, formulas addressed through structural performance of the device. Development of domestic wood equipment began in 1999, now has more than 6--7 years time. Through unremitting efforts of domestic equipment manufacturers have gradually matured, affordable products to meet the production, in order to reach the international advanced level there is still a long way to go. Domestic wood equipment at one-step and two-step method; and most of the domestic two-step method, the first dry granulation, and then extruded. Nanjing tournament Mong company after years of efforts to develop a special wood-step (patent) equipment. 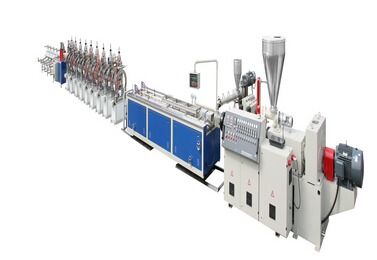 Single-screw extruder can complete the task delivery and plastics materials. 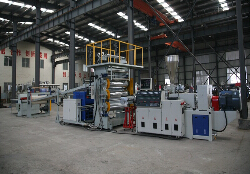 However, the role of a single-screw extruder delivery mainly by friction, because the wood flour fluffy structure, easy to extruder screw feeder, a longer residence time in the barrel, and wood flour filled polymer melt viscosity increases, increasing the difficulty of extrusion; and poor exhaust its effects; as well as its mixing plastics is not strong. Therefore, a single screw extruder by the WPC extrusion greater restrictions, the use of single-screw extruder screw must be specially designed screw should have a strong conveying and mixing plastics capabilities, Often the material for mixing prior to extrusion granulation. Problems: Exhaust poor; poor mixing effect; extruded product pressure fluctuations; low yields. And "compounded" apparatus than, different to the conical twin screw extruder is called low-speed, low-power "profiles" apparatus. Feeding section diameter of the tapered screw is larger, the material can be continuously compressed. You can shorten the material in the machine barrel residence time, and the metering section diameter small, shearing the molten material, which for the purposes of processing heat-sensitive WPC is a big advantage. Conical twin-screw must be specially designed. To meet the wide thermal resin processing requirements, there are many new features and demands to be able to adapt to the working range of the screw, to cut less wood fiber, resin is small can still make the wood fibers are uniformly dispersed and the material is completely melted. Because wood flour, vegetable fiber proportion of small, filled with large, feeding zone volume than conventional models of Japanese long. 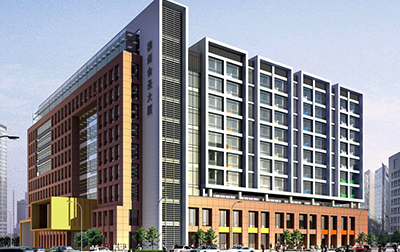 If wood flour, vegetable fiber added in an amount of molten resin rigidity, resistance to high backpressure requirements gearbox, screw pushing strong, using compression and melting fast, short metering section of the screw, to ensure wood fiber residence time is short, to prevent its rupture and performance degradation. But because of its screw structurally integral, it is difficult to meet the requirements of different process recipe, and mixing effect extruder worse than parallel twin-screw, easy to wear and tear, but also granulated. Iso can be processed directly to the parallel twin-screw extruder flour or plant fibers. So, to be completed and dry before wood flour molten resin is melted separately. You can also use another parallel twin-screw extruder, its front to dehydration, devolatilizer, wood flour ingredient added to the extruder mouth, dehydration, devolatilization, then add plastic resins, additives through a side feeder, plasticized extrusion. Thus, a relatively long extruder screw aspect ratio (L / D) up to 44 to 48, in which two-thirds is used in addition to water and devolatilization. This enables the melt processing step lower melting temperature, to avoid the risk of melt sintering. But also help to ensure that the next sawdust mixed uniformity and control the proportion of wood / plastics. However, the moisture content of the wood flour has certain requirements, the device easy to wear. Domestic rarely used. As we all know, in the same direction parallel twin-screw granulation equipment is plastic, it has good mixing, good dispersion, dehydration, dehumidification lined up waving good advantage, while using a single screw build pressure function. Give full play to the advantages of parallel twin screw and a single screw. This special equipment, no drying, no granulation, significant energy savings, high dosage. While adding fiberglass, improve product strength (also widely used abroad). Race Wong developed special wood-step (patent) equipment, is a national initiative, the international community has the leading position. It has now won four national patents. High quality: a number of national patents; rational design, fine workmanship, sophisticated material, durable. High efficiency: mixing plastics good, good liquidity extrusion speed, high efficiency. Ko Tim charge: mixing plastics good, good dispersion, high added (the amount of 70% plant fiber). Long life: barrel and screw element with special materials and long service life (15,000 hours). Apply a wide range: can be used to produce PP, PE, PVC, ABS, PS and various plant fibers. In order to increase product strength, glass fiber may be added. My company after a long period of research experiments, summed up the processing plant fiber interface of different methods, such as: wood flour; bamboo powder; rice bran; peanut shells; bagasse; Cotton rods; corn rods; rice straw; straw; and a milk box other treatment methods, has received very good results can be made according to customer requirements formulation process. 1, feeding Question: I am using the accurate measurement of two feeders, feeding separately to ensure accurate feed to prevent because of different specific gravity, and the problem of uneven charging. 2, effective devolatilization (ie remove water), to improve the system blending wood flour dispersed: I am using the same parallel twin-screw, a plurality of exhaust port for devolatilization remove water; use parallel twin-screw extruder mixing, plasticizing, dispersion and good, redesigned barrel and screw element to produce wood. Changes using a parallel twin screw modular principle, different plastics and reprocessing plant fiber threaded element combination, you can achieve a wide range of applications. In order to solve the pressure problem, we used a single screw, parallel twin-screw to Thee fill pressure is not built up enough. In the process control PLC control we use, so that the host and traction machine adopts closed loop control, to avoid the host speed and traction speed mismatch. Temperature smart thermostat meter or PLC control. WPC extrusion mold is the speed and quality of products bottle diameter, over the years we have accumulated a wealth of experience in mold design and manufacture, such as; hollow products; solid products runner how design, compression ratio much; how wide plate mold design and many more. Now my company equipment extrusion products speed is relatively high. Cooling stereotypes according to different profiles, choose different cooling. ① parallel twin-screw granulation equipment. Two metering feeder, make wood flour and plastic are feeding, to ensure accurate feeding. Make wood flour and plastic mixing, dispersing, burden, connected, thus ensuring the quality of products. Avoid the phenomenon due to the large difference between the proportion of plastic and wood flour to produce stratified during the addition, and affect product quality. ① using a specially designed threaded element, so that flour and plastic conveying and mixing plastics good effect. ② using specially crafted vents, remove residual moisture wood flour, to ensure product quality. ③ large aspect ratio (40: 1), so that the barrel heating temperature is low, to prevent the wood flour carbonation; a moisture exclude more fully; better mixing effect. ④ special head design, diced ensure uniform and reliable. ⑤ threaded element of special materials, long service life. Mixing plastics, poor, poor exhaust, the device easy to wear. (1), in strict accordance with equipment operating instructions. (3) Before extruder heating power needs in advance step by step, after heating to the set temperature for one hour before boot. Some of the feed screw with a heating device, feed screw and began warming in the boot, at the time of shutdown, should first feed screw cooling, in order to avoid material sticking. 1) Check the feeder, hopper, barrel without foreign body, if any foreign body must be clean. 2) Check the screw and barrel cooler cooled oil cooler (simethicone) the amount, must meet the standard requirements. If the cylinder is cooled by the cooling fan, you need to check it is intact. 1) Check the cooling water tank water level reaches the standard. 2) Check the cutting hood inside, are not allowed to affect the rotation of the blade object exists. 3) Check the gas line in each lubricator oil level, and drain cleaner. 1), put the host manifold outlet (this according to the actual need to determine whether to use, install the washer is not installed manifold), mold aligned horizontal alignment (horizontal foot) Tighten the bolts (note bolts tightness must be consistent, mold flange and host flange gap equal). 2), in order to correspond to the heating plate and thermocouple fixed on the mold, heating plate must fit tightly and die, and die by the thermocouple to reality. 1), the calibrator fixed stereotypes on stage, and in alignment with the mold on. 2), respectively the vacuum port, cooling water connection and setting the stage one by one vacuum port, cooling water interface corresponds to the coupling (with easy operation order). 3), the cooling water tank placed in the stage setting and alignment with the calibrator pair. Cooling pump: positive pressure showed that after a period of time to view the user interface if that part of the temperature change (warming?). A, host vacuum pump: a vacuum table to have a negative display. B, master cylinder and mold electric heating coil: is intact, normal temperature. C, stereotypes vacuum pumps, circulating pumps: pressure gauges have no negative, positive pressure display. D, traction equipment: (1) Tracked opening and closing properly; (2) the input pressure reaches 0.45-0.5Mpa, tracked up and down pressure should be 0.25Mpa; (3) adjusting the speed selection: manual (potentiometer regulation), automatic all normal regulation. E, cutting machines: manual and automatic (computer screen regulation) Cutting normal. 1, set on the feeder feeding time, intermittent time (actual extrusion process needs to be set). 2, set the barrel, mold, screw temperature (ibid.). When the master cylinder, mold, screw temperature reaches the set temperature, holding time starts counting down; the countdown procedure is in progress, the host is protected can not be started. Therefore, in order to save energy, the heating time does not have to screw with the host machine cylinder begin simultaneously. Time to master to ensure minimum time to reach the heating power requirement shall prevail. The actual situation ③ plastics molding profiles. 3) When viewed from the host material to vent to, you can open the vacuum exhaust unit, and at the same time you can adjust the feeder feeding quantity, so that the host of the screw inside the rapid formation of "material force" in order to achieve a higher degree of vacuum . And timely switch to clean. 4) When the material extruded from the die, plastics observation of materials, molding conditions, such as normal to synchrotron (with the host feeder screw); you should pay attention melt pressure and torque show host value, this Two indices are alert limits, beyond the limit at which a particular value or long-term operation at the critical limits will cause damage to the device. Exceeds a set value alarm. Slow to profile extrusion conditions, so the profile through a calibrator, cooling tank to a tractor; in this case should be based on the profile of the forward speed, adjust the speed of the crawler tractor, when both basic synchronized when the folder is closed TRACK holding profiles. Note: The vacuum can not be turned, only to water cooling setting; when the profiles are clamped crawler tractor only after opening the vacuum, implementation of a complete cooling operation stereotypes. No matter how high or low extrusion speed, tractor speed adjustment should always be shaped and extruded products to match the state (in normal production, can also be turned traction, melt pressure closed-loop system to keep the automatic control state). 6) To the profile surface embossing and typing, it should open the far-infrared heating device, adjust the height of good embossing roll from typing device, then turn on the profile surface air ring cooling after the embossing. Setting profiles by forming a switch or computer screen size and cut length pusher length dimensions. When the profile reaches the set value, automatically cutting saws for cutting, flip frame automatically pushed expect material rack. 1, first turn off the feeder; rear and feeder speed down, close the feeder. 2, when the observed amount of material extruded from the die noticeably small, off the heating system and mold cylinder, closed screw cooling devices, vacuum exhaust, and the screw speed zero after turning off the host. 3, close stereotypes station cooling and vacuum systems. 4, will move after shaping table, leave space disassembly of the mold (in case if you need to disassemble the mold under). 5, when the profile entirely by tractor, shut embossing system, typing system, traction machine, cutting systems. 6, such as the need to replace the mold, you can maintain the status quo. To replace the mold, the mold temperature should be lowered a little while rapid disassembly, cleaning out the material and the host interface connecting ring at. Note: You can not hurt the pressure sensor chip host interface when cleaning! ! 7, using compressed air forming table, dragger, water stains and residue material cutting device clean. 8, closed production line total power, water, compressed air source. 1, high-temperature mold heating portion could easily lead to burns, must wear protective gloves when operating. 2, when the normal operation of the tractor crawler, not free to open the fence; prohibited repair and maintenance in the tractor running, to prevent accidental entrapment. 3, cutting saws produce non-open view during the operation, repair, maintenance, must cut off the power and air supply. 4, prohibited the use of iron into the extruder barrel internal poke, pry. Especially in front of the confluence of the core barrel pressure sensor site. 5. Removal of mold and calibrator, when exposed to the inner surface of the mounting surface must be made of copper tools, prohibited the use of iron utensils! To prevent the flow channel, forming surface and the mating surface is scratched. 6, the heating coil under demolition, bolts, etc. is prohibited on stereotypes within the station tank, it must be placed on the surface of a dry table; when using a threaded bolt again must brush silicone oil. Routine maintenance by the operator on a daily basis, the main contents are: clean, lubricate and check the status and fastening parts complete loose parts. An apparatus according to usage, for some parts removed and cleaned; some with the clearance of the equipment make the appropriate adjustments; clean surface oil, lubricating oil passage to check the adjustment, ensure the smooth flow does not leak; cleaning electrical boxes, motors, electrical devices, do fixed tidy, reliable security guards; cleaning accessories and cooling devices. Level maintenance shall be directed at a full-time maintenance workers, borne by the operation of the workers. An apparatus according to usage, a partial disintegration of the equipment inspection and cleaning; cleaning oil change for a variety of housing, fuel oil to meet the requirements, to ensure the normal lubrication; repair, replacement of wearing parts; repair electrical box, motor, line; inspection, adjustment, repair accuracy, correction levels. Secondary care overhaul undertaken by full-time workers, workers in the operation to assist. (1), always check the extruder internal temperature heating and cooling tank tank tank oil level and oil condition, if found to reduce oil and oil stain in place to immediately supplement or replace. (2) only when the confluence of the extruder head plastic core was molten state, allowed to disassemble the pressure sensor can be used to clean the hard tools allowed the plastic confluence within the core, otherwise it will damage the pressure sensor interface . (3), the extruder must always check the data on the computer screen or the operating instructions of the instrument, especially the host torque display and merging core melt body pressure display, if the display exceeds the limits prescribed extruder need immediate stop to check and take timely measures to resolve. Normal operating pressure should be less than 20Mpa, with about 15Mpa more moderate, also at 45Nm ~ 60Nm torque in. (4), check the fluid level regularly each extruder gearbox oil level height and screw the thermostat tank, promptly added to the corresponding grades of lubricating oil and thermal oil. After half a year, you should check the quality of all types of oil and timely replacement. (5) added to the feed hopper of the extruder are not allowed inside the metal debris mixed to ensure that the screw and barrel from damage. In the hopper equipped with a magnetic holder, regularly check for and remove adsorbed on a magnetic rack metal debris. (6), the extruder is found abnormal noise during operation, should immediately stop inspection, troubleshooting and then boot. (7), extrusion confidential kept clean and well lubricated condition. Ready to do the electrical cabinets, console the wiping and lubricating work. The working parts of the machine should always be dust, decontamination, in addition to impurities. (1) should be checked once a week and feeding the spring motor coupling is reliable to prevent feeding spring loose or fasteners falling into the hopper and damage the host, and always check whether there is debris on the wound spring. (2), always check the work on the feeder spring and cover between the nylon tube, such as nylon tube badly worn should be replaced. (1), the feeding of the spring and the motor coupling sleeve fixing screws, electrical connection sleeve and the motor shaft fixing screws can not be demolished. (2), aircraft and definitely not reversed, otherwise it will damage the machine. Screw core tempering device should be checked for loose fittings, oil spills, leaking, if found to reduce oil supplement that is played; in hard water area, we recommend regular demineralized water in the cooling water by adding a solvent to prevent the wall of the cooling system have a scale impact of cooling water capacity. Note: The above three indicators as long as there is a scrap reached should be scrapped. 1, oil (water) pipes and working chamber or working chamber channel is too narrow for the large long positions serpentine channel resistance. 2, oil (water) pipes and working chamber obstruction, there are deposits or other debris blocked the dirt. 3, the solenoid valve malfunction. 1. Check the heating and motor control circuit is working properly. 2, check the thermocouple is working. 1, clean up and clear passage (water) pipes. 2, replace the solenoid valve. Replacement of electrical accessories, to make it work properly. 1) Remove the oil pump drive shaft end and the motor bracket at the screws. 2), before removing the oil pump and the oil pump cover, replace the seal. 4), according to the above in reverse order so the front cover fitted, can be fixed with screws. 1) Remove the cover and pump coupling screws and remove the cover. 2) Remove the O-ring, to see whether the deformation, such as deformation is required for the same type of high-temperature O-ring. 3), according to the above is installed in reverse order, requiring cover and pump coupling two flat clean. 1, the system running for some time, if found pumping rate decreases, pump heavier sound, indicating the need for a vacuum tank filter clean or replace the filter, the extruder may be at work, set the operation of the rotary valve to the service position quickly remove the transparent sheet and the filter on the vacuum tank, cleaning or replacement is completed for a short time after recovery, set the rotary valve in working position can be, if the extruder is sufficient parking time, you can completely clear the vacuum tank and suction pipeline. 2, if the extruder long-stay parking, water pumps shall within drained through drain port, especially should pay attention to the freezing season, to prevent the cracking of a vacuum pump. 3, if the higher operating water hardness, then at least once every six months to open the vacuum pump to remove the inside scale. c, check the vacuum tank filter is clogged. c, check the filter is blocked, such as the blockage is clean replacement. 1, tractor work should be avoided hitting profile cutting saws, always clean cut sawing cuttings. 2, shaping table should be kept clean and free of debris to ensure smooth flow of water at reflux, regular cleaning of pumps, gas water separator filters through the water, in order to ensure the normal operation. 3, should be kept clean and free of debris inside the spray tank, you need to regularly clean the pump filter. When failure analysis, first understand the working principle and structure of each part of the device. Once you've mastered its working principle and structure, we will be aware of the occurrence of the problem fundamentally, then gradually find out the root of the problem. Be sure to read the product manual carefully. (1) single screw and barrel arm had local friction, whether open screw inspection and gearbox connection dirt. (3) issued by the rhythmic sound of friction is sometimes caused by single screw without material, it should increase the feed speed to increase feed. (4) small motor current feedback to produce crawling, should re-adjust the amount of feedback. (2) a power failure, check the power and troubleshooting. Safety pin broken, replace the safety pin should be shut down immediately. g controlled cooling of the solenoid valve stuck in the open position or the solenoid valve is not powered up, the solenoid valve should be repaired or replaced. (3) vacuum inadequate water supply. (5) Cylinder support loose, can not afford a supporting role. (4) The main circuit thermal relay trip, it should reset the protection system, turn the heat relay.